The August Break is ON! Not only did I send my edited manuscript back to my editor yesterday (WOOT!) 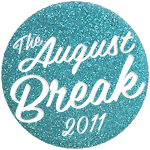 but I am excited to tell you that the August Break is back! Last year I wanted to have a break from blogging (words, at least) and decided to post just photos throughout August… and over 500 people joined me. It was such fun, and the Flickr group was so lively and welcoming, that there was no way i wouldn’t be doing it again this year! The plan is: you simply share one photo (or more!) per day on your blog – Monday to Friday, or every day .Or whenever you feel moved to share. Using any camera – DSLR, compact, Polaroid, Holga, iPhone (my choice), Instax, film or digital – with or without words – anything goes! – for the whole of August. No pressure – just looking at August through your camera lens as a way to be more present this summer. And to have a little break from the pressures and expectations of regular (wordy) blogging. I’ve created a page for our blog roll — last year there were so many new blogs to read, and lots of lovely new bloggers to connect with, so head on over to add your blog to the list (it’s not a requirement, obviously – no rules, remember? 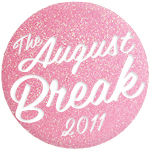 :) Plus we have the blingtastic new badges that Katrina from Pugly Pixel has created for us (thank you Katrina!). The August Break is ON — spread the word! Ooh I am so in!! I bombed out about halfway through last year…but what I did do was such fun. Yeah ! I’m in … again ! ? Congratulations on sending off your manuscript! Yea for you .. manuscript done.. summer can begin! yay! I participated last year and it was great fun! I can’t believe it’s already August again, though. I “Squee’d” on my blog about this today. Been looking forward to this – thanks beautiful. And huge congrats on your manuscript – WOOT indeed! This year I’m traveling in the US for all of August so this is perfect. Time for a break! excellent, i was hoping you would gather this again this year. It’s not summer here – and I’m going on holiday for the last week in August – I don’t usually have internet access on holiday – but I’ve decided to post a photo a day for a month starting now, there’s just time for that before I go away. On all three devices. On Firefox and Safari. Everyone seems to be getting on, how weird. I will definitely join in with this – it will be less of a break and more of a resurgence as I’ve been a very lax blogger of late. A photo a day will be an improvement on nothing for weeks! thank you again for this opportunity, looking forward to meeting you all very soon ! so so pleased the break is back :) happy summertime photo adventures everyone! and thank you Susannah! This is such a great idea!!! I’m in! I’m very excited to see all these great summer pictures from all aver the world!! Mines will come from latin america! What a cool idea! ;) I think I’m joining you! Im so outta my league here…but one has to start somewhere!